I am not an expert of food nomenclature but i think any kind of paneer cubes cooked in a rich cashew nut gravy is not paneer pasanda ....thin slices of paneer sandwiching a rich stuffing in between is the essence of paneer pasanda.......and this posts intends to describe the assembling of the paneer pasanda , i have taken step by step pictures and the prepared pasanda can be frozen for future use or can be made with different types of gravies. Make a coarse paste of tomatoes and keep aside ... i used my chopper for this. Make a coarse paste of onion and garlic separately and keep aside. Heat the butter in a pan and add the coriander seeds, peppercorns and cinnamon stick and wait till they pop. Add the onion and garlic paste at once with salt , stir to cook till the paste becomes translucent and shiny. Add the red chilly powder and tomato paste and cook on medium heat till it becomes a thick sauce....stirring occasionally. Add the tomato ketchup and the fresh cream to finish , bring to a bubbling boil , add some water if the sauce has thickened to your taste or requirement. 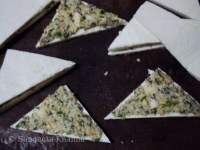 Add the prepared paneer triangles and cover for just a minute . 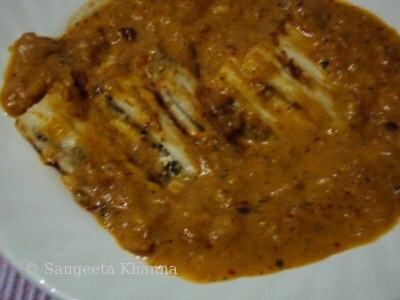 The paneer pieces may separate to expose the filling if the sauce is boiled too hard after adding them , so it is advisable to prepare the sauce and the pasanda triangles ahead of time and keep them separately until it is time to serve. Serve immediately with rotis , naans or parathas........i cooked this dish for dinner so the pictures are not very good , it doesn't matter to me much as the procedure n recipe has to be clear and the pictures are just demonstrative.........better pictures are always welcome but it should not deter me from posting a recipe i think......what say?? 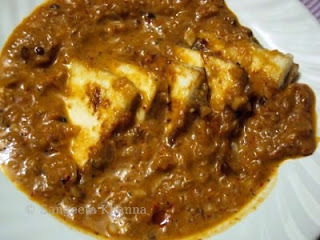 The gravy is hot with peppers and red chilly so it is essentially a hot dish for me , many people like it blander ...that is cashew and mint being the core players and keeping everything else subtle........it can always be adjusted to your taste and preference .........i would suggest the white gravy paneer pasanda if you like it blander with cashew as a main flavor and especially if it is being served for a party ........it is essentially a party dish unless you feel like having a feast just for yourself n don't mind spending some extra time on the kitchen platform.........i make an easier version of paneer with essentially the same ingredients n flavors but that doesn't qualify to be called a pasanda ......will post that recipe soon..
A rich and creamy dish looks wonderful. Same for me dear, I keep changing the stuffing and the gravy in the Pasanda. What perfectly sliced triangles. I liked the idea of freezing them and yes the pics have made feel very hungry and for me Naan goes well with the Pasanda. 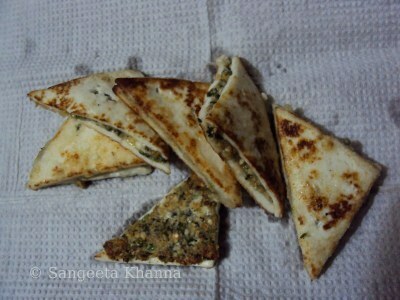 My mouth is full of water rightnow...wow those stuffed paneer triangle making me hungry. thanks for sharing this,..looks perfect for party..
wow what a detailed recipe.anyone can try this delicious dish..looks so yummy really liked the stuffing..
lovely recipe! 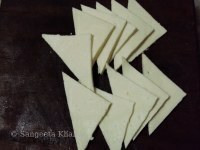 u r right, the paneer triangles could make a snack themselves, look so good.. Excellent idea to prepare the paneer sandwiches in advance and freezing them..loved the detailed description of the process with step by step pictures...makes one confident enough to attempt. 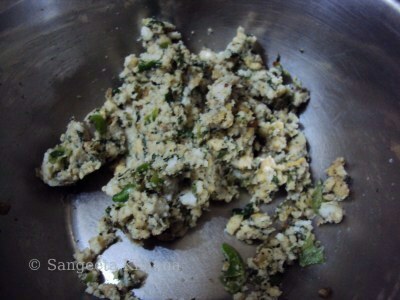 Hi Sangeeta, thanks so much for the step-by-step paneer pasanda recipe. I made it this week and it turned out very well. I've added a linky to this recipe in my blog. Sorry for any mistake. I feel exasperated if you call copy pasting a mistake...this a deliberate offense dear.